Wardrobe full to bursting, closet spilling out, clothes lying around everywhere and a mess that only grows as the days go by. But how can you arrange your storage on a budget? Is it possible to organise your closets without following the Marie Kondo method to the letter? If you’re planning to add extra storage solutions to your walk-in wardrobe or dressing area, then seriously consider open clothes racks. Less imposing than a wardrobe, clothes racks save space and optimise small areas. Here are 3 stylish budget solutions to organise all of your clothes. The first option is a steel clothes rack on wheels, with adjustable height: the Range Eco. These steel clothes racks are sturdy and stable, perfect for hanging heavy garments such as coats. They add an elegant, pared-back look to your room, and are perfect for a bare wall. This steel clothes rack stands out for its simplicity, fitting in perfectly with modern, refined decor. Stylish and reliable at the same time, the Range Eco clothes rack is an ergonomic solution that will suit even cramped spaces. Rack height can be adjusted between 108cm – 175cm. Thanks to the 4 wheels, this spare clothes rack is practical and unobtrusive: move it about effortlessly, wherever you like. 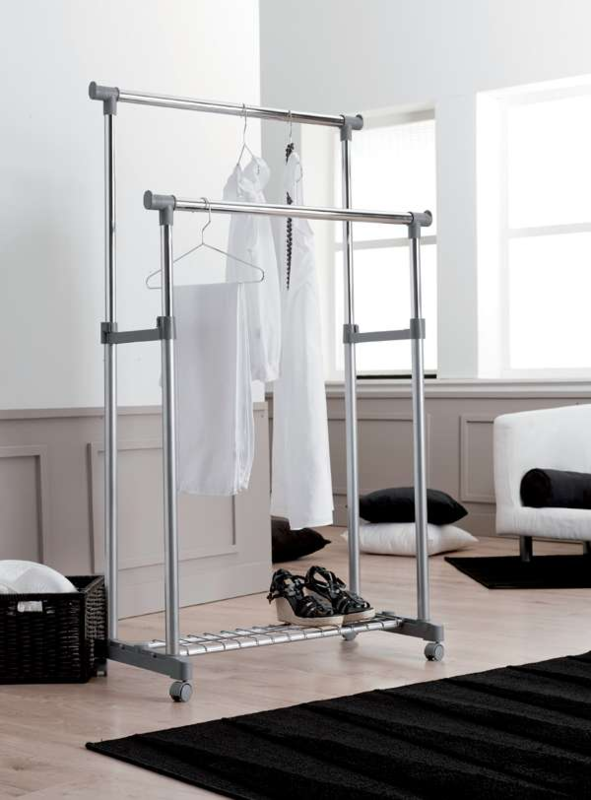 The second model on our list is the Niels clothes rack, an elegant, discreet white clothes rack. White clothes racks blend in with your decor (most walls are painted white). 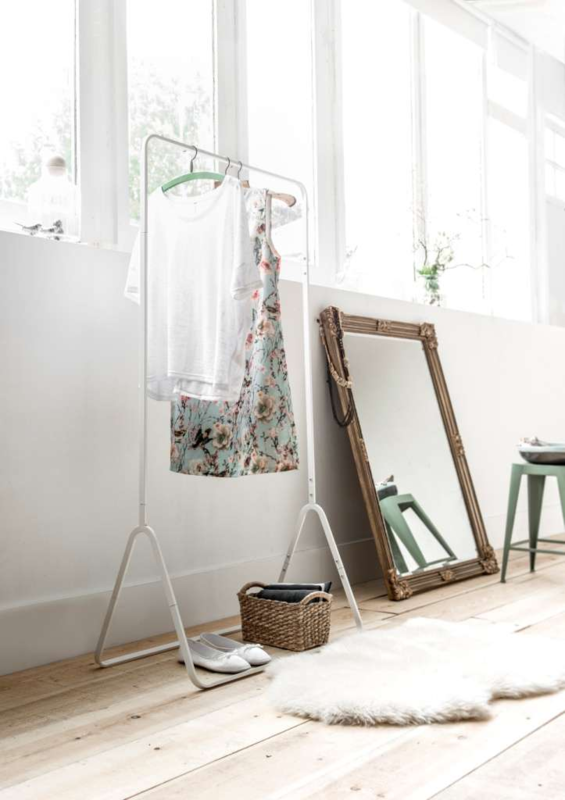 Perfect with a Scandinavian style, this clothes rack lets you create a calming, natural atmosphere. Made of steel, this rounded model in white is much more than just a spare clothes rail. Its minimalist style turns it into an item of decor too. Niels is a compact, stationary model that can hold up to 10kg. Its size (79.5 x 41 x 150.5cm) makes it ideal for “dead” spaces or poorly exploited areas such as under the stairs, the corner of a room, or on a big blank wall. If you have a large collection of clothes that just don’t fit in the wardrobe, perhaps you should consider a clothes rack that offers superb storage capacity. The Alex 2 level clothes rack is height adjustable and easy to move, providing a great solution if you’re lacking space. 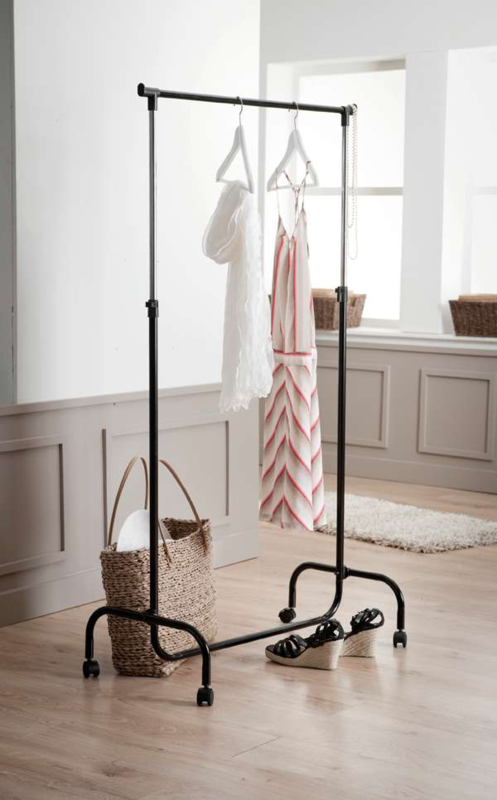 Made of lacquered steel, this clothes rack lets you vary the height of the rails according to your needs. Fitted with a mesh tray at the bottom, perfect for holding your shoes or storage boxes. 1. What type of clothes will you hang on your clothes rack? Coats obviously take up more space than shirts. The size of the clothes rack and the materials it’s made from should be suitable for the type of clothes you need to store. Also consider hanging vacuum bags to flatten your clothes without damaging them. 2. Second question: Where will the clothes rack go? Do you want to exploit the height of your ceilings? Or do you want to use the space under the stairs? Settling on where your clothes rack will go helps you to better choose the correct size, height, shape and material for the rack. 3. Finally, will you need to move your clothes rack every now and then? Or will a stationary model do? Don’t forget that if you lack space, a model with wheels allows you to move the rack wherever you like, meaning it won’t inconvenience you. Once you’ve answered these questions, you should be ready to make the correct choice.